A development group that tabled plans for a large mixed-use project in Germantown is presenting a revised version behind the scenes to key players, but the group is not quite ready to return to the city with the changes and re-enter Germantown’s review process. 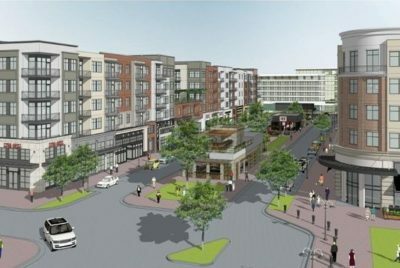 The Atlanta-based Carter development company unveiled plans for Germantown Town Center in March. The $200 million project is destined for the Arthur Property surrounding Iberia Bank on the west end of the suburb’s central business district. The 32-acre site adjacent to Saddle Creek West stretches between Poplar and the Norfolk-Southern Railway line. After receiving Planning Commission approval for the concept in April, Scott Taylor, chief executive officer for Carter, asked the city’s Board of Mayor and Aldermen to delay the application in May as they worked with neighbors regarding some of the concerns. The group did not present the new plan by Friday afternoon’s deadline for inclusion on the Planning Commission’s next meeting Sept. 5. “We have recently been meeting with elected officials, staff and neighbors sharing a revised plan based on feedback we have received over the past few months,” Taylor said in a text. “We have not determined when we will file a revised plan for review by the Planning Commission as we believe we need to meet with more residents to continue seeking their feedback.” The original plan called for 56,000 square feet of office space, 254,000 square feet of retail uses and 302 multi-family units. The site is adjacent to five homes on the east side of Miller Farms. Those residents, while complimentary of the plan, were vocal about the impact on their property, particularly regarding drainage, encroachment on their land and patrons of the project looking over into their property. Alderman Forrest Owens, the Board of Mayor and Aldermen liaison to the Planning Commission, was among those who met with Taylor. He said the new plan has more condo-type units for sale rather than rentals and a reduction in retail space. That retail space could focus more on entertainment uses and additional restaurants. “I’m excited,” Owens said. “And cautiously optimistic. It looks like a good plan to me.” Alderman Dean Massey likes that the new outline reduces the density from the original version, but there are still some concerns. He said before he can support the project, he wants to explore how it changes the overall character of the city, along with how it impacts traffic and existing businesses. “The Carter Group clearly made an effort to increase connectivity and scale down the scope of the project,” Massey said, adding he wants to make sure some of the hardwood trees are preserved.